In this post, we’re going to go over all of the main features of the Osmo Pocket and Hero 7 Black while also putting them through a few tests. Along the way, I'll show you the biggest reasons to go with one camera or the other. We also have multiple test videos in this post that show things like low light performance, audio quality and more. Ever since photos of the Mavic 2 leaked over the summer, we’ve been seeing little bits and pieces of the Osmo Pocket. 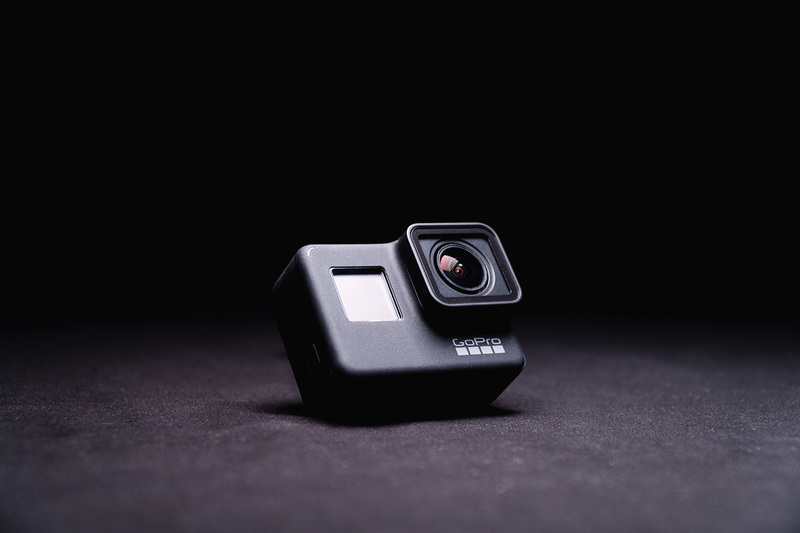 Now it’s finally out and looks just like the rumors said it would, but with the new GoPro Hero 7 Black Edition at a similar price with similar specs , many people are going to be confused over the holidays. The Osmo Pocket and Hero 7 Black are very similar yet completely different at the same time. Starting with the GoPro, it’s a very familiar design. We’ve all seen GoPros before and the Hero 7 isn’t much different from the Hero 6. The biggest difference that you will notice is that it’s all black instead of grey like the older models. There are only two buttons, one on the top for recording video/pictures and a power button on the side. Every other setting you can change from the touch screen or the mobile app. From a durability standpoint, this camera is bullet proof… well, not really, but it will survive a few drops with no problem, especially since the front and sides are mostly rubber. if you tossed it out of a car window, the large touch screen would be the first thing to break, however, if you keep the Hero 7 in it’s protective housing while shooting, the screen will be mostly protected. The Hero 7 is also waterproof up to 30 feet without using an additional housing. Although the Osmo might seem like a fragile little stick with a super breakable gimbal, it’s built very well. The main body is made from some kind of plastic. The screen is glass just like the Hero 7, but much smaller. The gimbal although tiny is all machined metal. No flimsy ribbon cables that could break either! To be clear, I wouldn’t expect the Osmo Pocket to hold up to more than an occasional drop or two, but I think it’s built as good as possible for a product with a 3-axis gimbal. Durability isn’t the best compared to the Hero 7, but one thing that the Osmo Pocket does have is an accessory port. When you get the Osmo Pocket, the accessory port is used for connecting your phone to it using one of the adapters, but this port has many other uses. 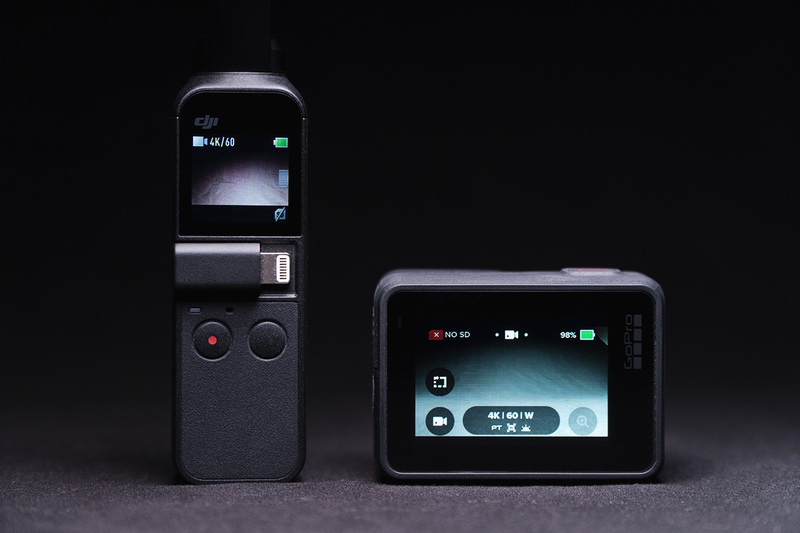 DJI will be coming out with a hand full of smart accessories that connect to this port to add additional functionality (more buttons, selfie stick controls etc). One thing you won’t be doing with your Osmo Pocket on day one is taking it underwater. 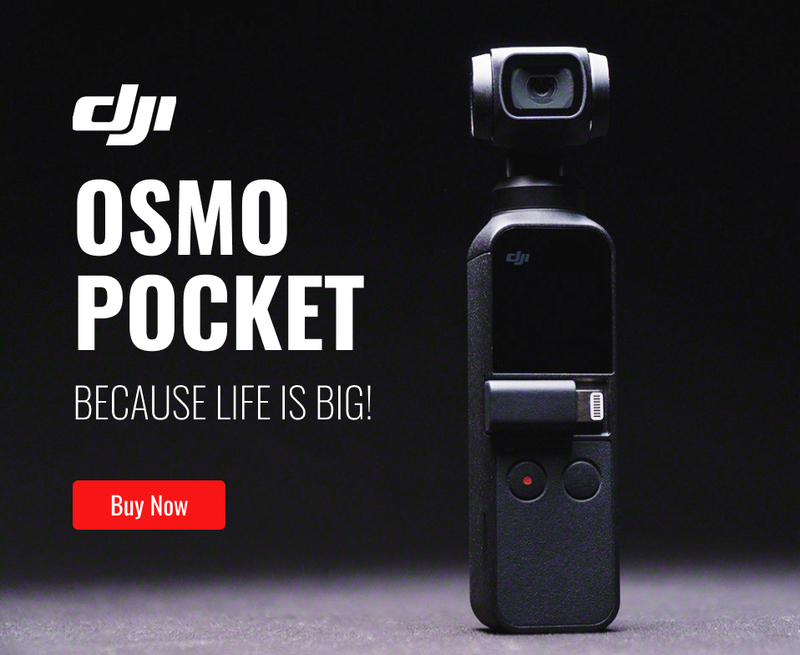 The Osmo Pocket is not water proof in any way, however DJI will be making a waterproof housing for it. This special housing will allow you to go down to 196 feet which is the same depth as the optional waterproof housing for the Hero 7. The Hero 7 has one of the best user interfaces i've seen on a camera. It’s easy to use, there aren't a million menus to go through just to change a simple setting like framerate, and being able to do everything from the back screen instead of using your phone is great. What I don’t like is not having full manual controls. There are some pro settings like white balance and color profiles when you turn on the Protune option, but you don’t get to control the shutter speed and ISO manually. If you want to connect the Hero 7 to your smartphone, it should be a simple process with the built-in WiFi, however I wasn’t able to get my iPhone connected for some reason. I’ve used other GoPro cameras and connected them to my iPhone with no problem, so maybe there’s something wrong with the current firmware? Just like the Hero 7, you can control most of the settings on the Osmo Pocket from the touch screen on the back. You can change video resolutions and framerates, gimbal settings, view videos and photos that you’ve shot, but you don’t get any of the pro features unless you connect your phone. The Osmo Pocket doesn’t come with WiFi, but you can still connect your phone using the included adapters which I actually prefer over the slower wireless connection. If you still want to control the Osmo Pocket wirelessly, there is a WiFi module that plugs into the bottom USB C port. Once you have your phone connected, you then have access to all of the same pro features that the GoPro has and more. You can even adjust the shutter speed and ISO. If you disconnect your phone from the Osmo Pocket, the manual settings will stay on until you try to change them from the touch screen. 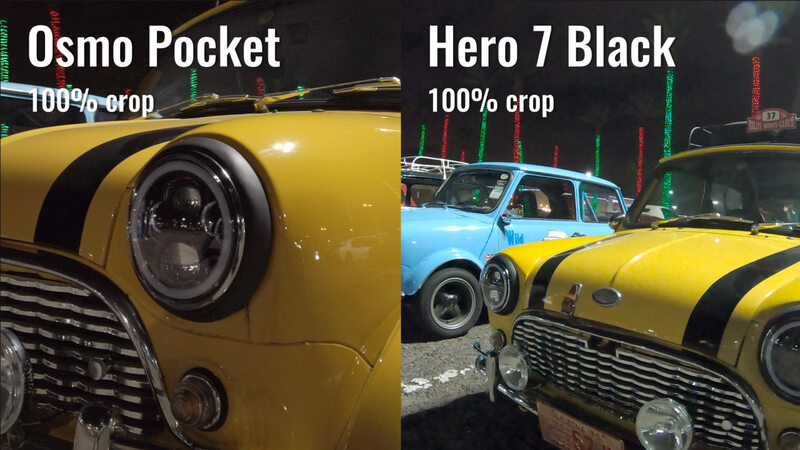 Both cameras shoot 4K video at 24, 30 and 60FPS, but one thing that you get on the Hero 7 is the ability to shoot 2.7K at 120FPS, or 1080P at 240FPS. For more cinematic forkflows, the Osmo Pocket can shoot 4K at 48FPS which conforms better to a 24FPS timeline. For most people including myself, 4K 60FPS is the most important resolution, but if you need higher frame rates, the GoPro will be a much better option. If you like making things look cinematic, one of the best features for a camera to have is good dynamic range and colors. If you didn’t know, dynamic range is simply the range of light that the camera is able to record (from dark to bright). A camera with good dynamic range should be able to capture most scenes without losing details in the hilights and shadows. 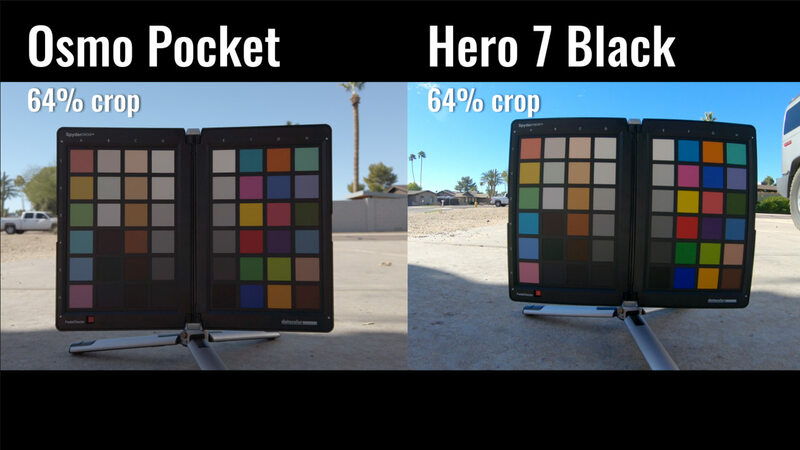 Here’s a test shot of a color chart to show off what differnt colors look like on the two cameras. 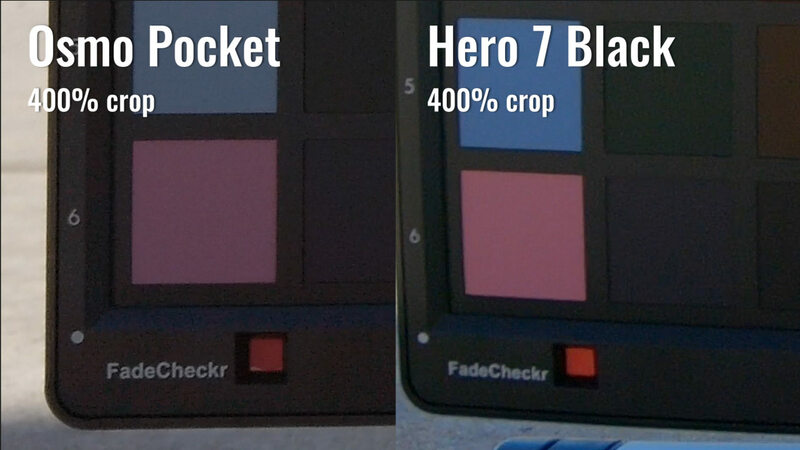 For both cameras, I set the color profile to the flat setting (Cinelike on the Osmo and Flat on the GoPro). It’s pretty easy to see that the colors on these two images look different, but what is different about them? The first thing you might notice is how the Hero 7 is more saturated. What’s harder to see is that the Osmo pocket has slightly more dynamic range. 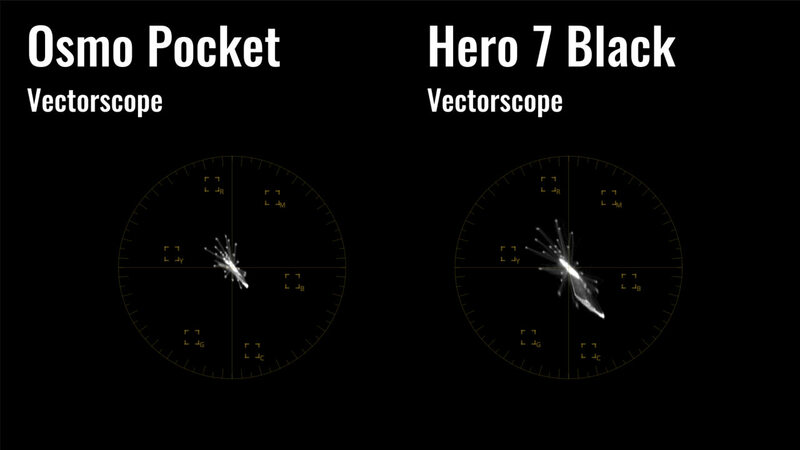 For you color nerds out there, I put the two videos through what’s called a vectorscope. With this, you can see how much more saturation the GoPro really has. If this footage was shot in the normal color profile (not intended for color grading), having more saturation would be a good thing, but when shooting in the flat color profile, your footage shouldn’t be this saturated. If you have too much saturation, it can make your footage look crazy after color grading. To check the dynamic range, you can use a waveform monitor. If you don’t know how to read this chart, don’t worry. Just know that the bottom of the chart is where the darkest parts of the image should be and the top of the chart is where the brightest parts of the image should be. Notice how the waveforms for the Osmo stay within the chart where the GoPro waveforms are cliping at the top and bottom. The field-of-view on these cameras are completely different, so it’s hard to objectively measure things like sharpness, but here’s a cropped image of a color chart from about 1.5 feed away. On the GoPro, I set the sharpness setting to medium since that is what people in the comments recommended. On the Osmo, there is no sharpness setting to adjust. Based on this test, the Osmo Pocket seems sharper to me. Keep in mind that the GoPro is always focused to infinity, so it might be sharper when looking at far away objects (haven’t tested yet). Another area where these cameras are completely different is their low light capabilities. 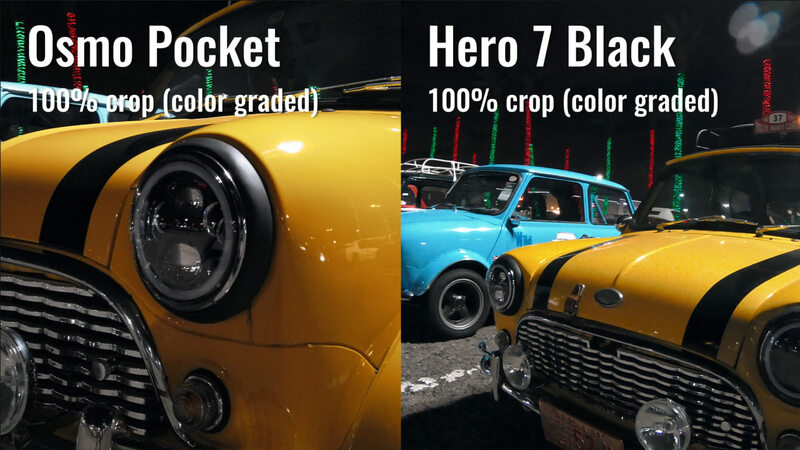 On the Hero 7 Black Edition, the max ISO goes up to 3200. On the Osmo Pocket, the max ISO only goes to 1600. Don’t be fooled though. These specs mean absolutely nothing once you see the camera footage. Below, you will see my low light comparison video. Everything in the video was shot with the Osmo Pocket and Hero 7 Black. Also, If you look at the bottom left corner of the video, you can see the camera information for each shot and if it was color graded or not. I was going to do a more traditional test where I set everything up on a tripod and manually set the exposure, but then I got a call from a friend asking if we were going riding that night. I think in the end, the video came out much better thanks to that call. For the best quality, I chose to shoot in 4K at 24FPS. On the Osmo, I used the Pro mode to set the color to “Cinelike” and turn noise reduction off. On the Hero 7 Black, I used Protune to set the color to “Flat”, then set the max ISO to 1600 since the Osmo can’t go to ISO 3200. I searched for a way of turning noise reduction off on the GoPro, but I couldn’t find anything in the settings or anyone mentioning that as a feature online, so I’m going to assume that isn’t possible. For this comparison, I wanted to create a real world scenario and shoot with both cameras in a way that was unstaged. To do this, I didn’t use any of the manual controls that the Osmo Pocket and Hero 7 have. Both cameras were shooting with automatic exposure and white balance. Unfortunately, since consumer cameras don’t have any metadata attached to the video files, I don’t have a way to see what ISO each shot was at. Honestly, I don’t think you should be thinking about if a camera is at ISO 400 or ISO 800 when you’re out shooting. For the type of videos that most people will use these cameras for, I think the settings that I used are perfect. With auto exposure, you can run around and shoot video on the Osmo Pocket without having to attach your phone which is the whole point of the Osmo Pocket in my opinion. 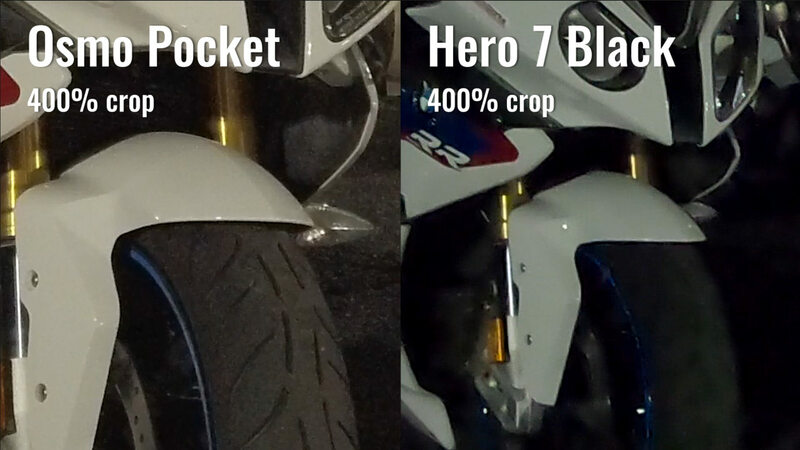 Here you can see how the overall image on the Osmo Pocket looks better at night than the GoPro. The noise on the Osmo looks more fine and film like where the noise on the GoPro looks very processed do to the in-camera noise reduction. After zooming into this test shot, the winner is pretty clear. The image quality on the Osmo Pocket just blows the GoPro out of the water when it comes to low light shooting. I think this is partly do to the larger aperture on the Osmo. 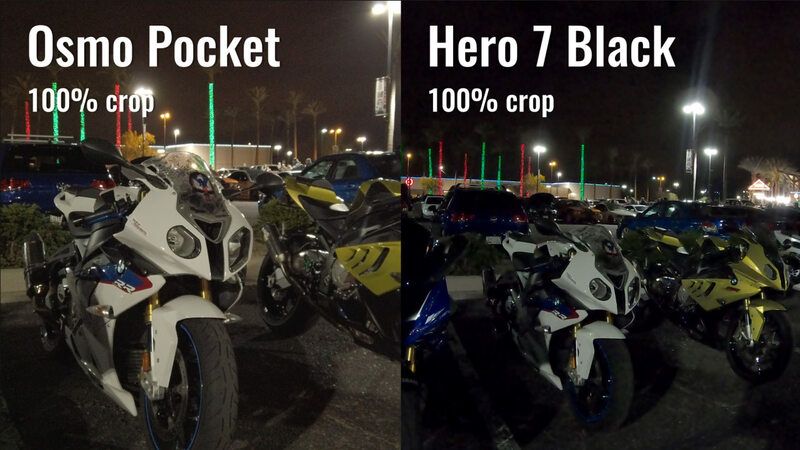 Also, since the Hero 7 Black was in hypersmooth mode, the automatic exposure may have raised the shutter speed slightly to minimize motion blur in the video (although not likely because there is still lots of blurring artifacts). Looking at a bunch of raw shots is ok, but I wanted to see what both cameras looked like after doing some color grading. This is what a shot looks like before color grading it. Since it was shot in the flat color profile, the colors don't pop out at you like they do in the standard profile, but that's what color grading is for. This is what it looks like after doing the color grade. Can you see the difference? The only problem with color grading video is that you have to start out with good looking footage. In this shot, you can start to see some artifacts on the hood of the car (mainly on the GoPro), but it’s not too bad. Here’s another shot where I zoomed into the hood of the car by 400%. 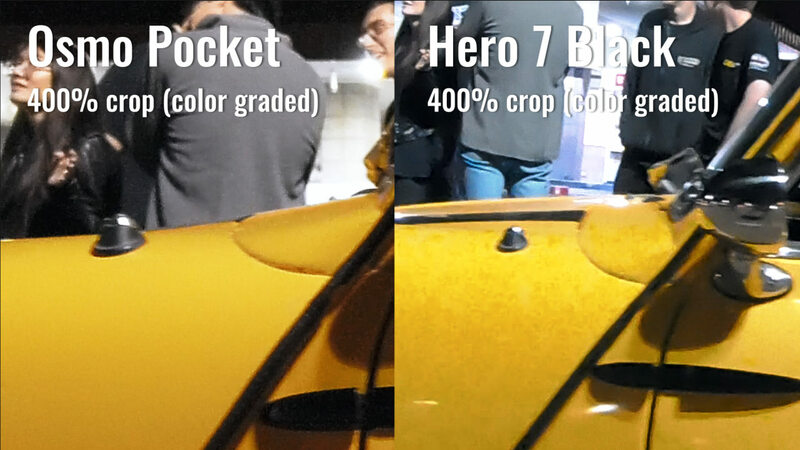 Notice how the Hero 7 Black footage falls apart more when you grade it (at least for these shots). In the Low light video above, I also did noise reduction using Resolve (my editing software) on one of the shots (2:27). If you look at the shot of the orange car, you can see how clean the Osmo Pocket looks after applying temporal noise reduction. I tried the same thing on the Hero 7 Black, but since there is so much noise and the noise pattern is so large, it didn’t really do much. Here’s a quick vlog style video I did testing out the two cameras. I know, I’m not really a vlog person, but I figured that’s what this camera is made for, so why not give it a try. Both cameras were set to 4K 60FPS and all of the settings were on auto. Looking at the footage above and some of the other footage I’ve shot in full automatic mode with these two cameras, here’s what I think about the video quality so far. The Hero 7 Black tends to expose based on the whole scene where as the Osmo Pocket tends to expose the scene based on whatever is in the center. This isn’t really a good or bad thing, just what I noticed. In this example, the Osmo brightened up my face while blowing out the sky, while the GoPro kept the sky details but made my face too dark. Since the Osmo Pocket has a large aperture lens, It also makes some background bokeh (background blur) which looks great. The only thing I really don’t like about the Osmo Pocket footage is the autofocus. It’s pretty slow compared to other cameras. Since the GoPro doesn’t have focusing, everything is always in focus but you don’t get any of that nice bokeh. Audio quality on both of these cameras is nothing to write home about. For general use, both cameras will give you OK audio, but if you heavily depend on your audio sounding good, get an external microphone and sync the audio back later. In this video, I did a few audio tests with all of the current audio settings that were available on the Osmo Pocket and Hero 7 Black. The osmo Pocket currently has one setting for audio called Audio Amplification. You can find this in the pro settings. With this setting on “Low” the audio is very quiet. In the “Moderate” setting, it gets a bit louder, and on the “Fine” setting the volume level is normal. Later I tried leveling out the volume in my editing software so I could hear what the different settings sounded like at the same volume. The fine setting seems to be the best. I’m guessing if you were somewhere loud like a concert, the low settings would keep the Osmo from turning the gain to high and clipping the audio levels. 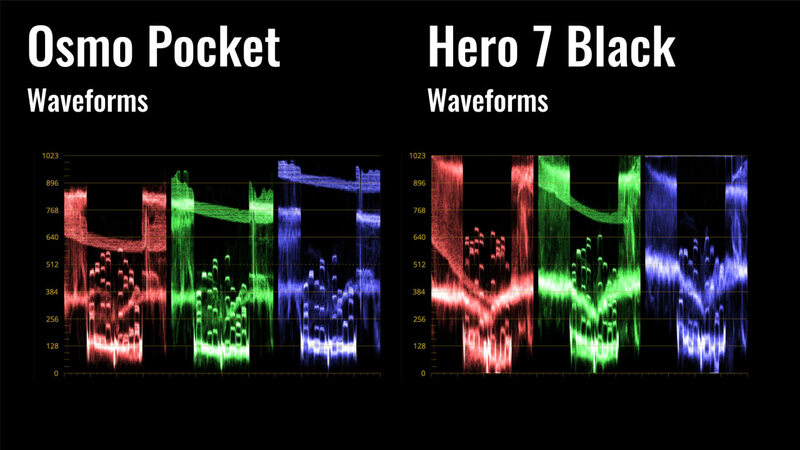 The Hero 7 Black has two settings for Audio. The first is for adjusting the amount of processing that is done. There’s four option here; Raw Audio, Low, Medium” and High. All of them sounding very similar to me with the exception of Raw and High. the Raw mode sounded more raw, and high made it sound more like the Osmo where voices were more punchy. There’s another audio setting on the Hero 7 Black for canceling out wind noise. When I set it to Stereo Audio, it sounded like a normal microphone. When it got windy, you could hear the wind. When I put it into Wind mode, it did seem to cancel out a lot of the wind, but it sounded terrible in my opinion. I would recommend keeping it in Stereo Audio mode. the audio on the Osmo Pocket can sound very good, and not so good depending on what you’re trying to do. For anything where you’re trying to record someone talking, the Osmo sounds great. When you try recording ambient sounds, that’s where it has trouble. It seems like the audio algorithms that DJI uses filter out most of the ambient noise in the environment. The Hero 7 Black is just somewhere in the middle. It doesn’t sound as good to me as the Osmo Pocket for vlogs and voice overs. Voices sound a bit more muffled with less clarity in the high tones. Where the Hero 7 really shines is when you’re not trying to record voices. It picks up the ambient sounds a lot better than the Osmo with a more unprocessed raw sound. Both of these cameras have different drawbacks compared to just using an external mic. Like I said at the beginning, you should have a good microphone if you really want good audio. Get a lavalier mic for voices and an external recorder with built in mics for recording to an SD card and recording ambient sounds. Another alternative if you don’t want to use an external recorder is to get a USB-C audio adapter. GoPro makes an adaptor that plugs into the USB-C port and has an audio jack on the other end. Using this, you can use whatever microphone you want. DJI has a similar adapter, but it isn’t available yet. Both of these cameras have some form of stabilization, but they way they work is completely different. On the Hero 7, the stabilization is completely digital. 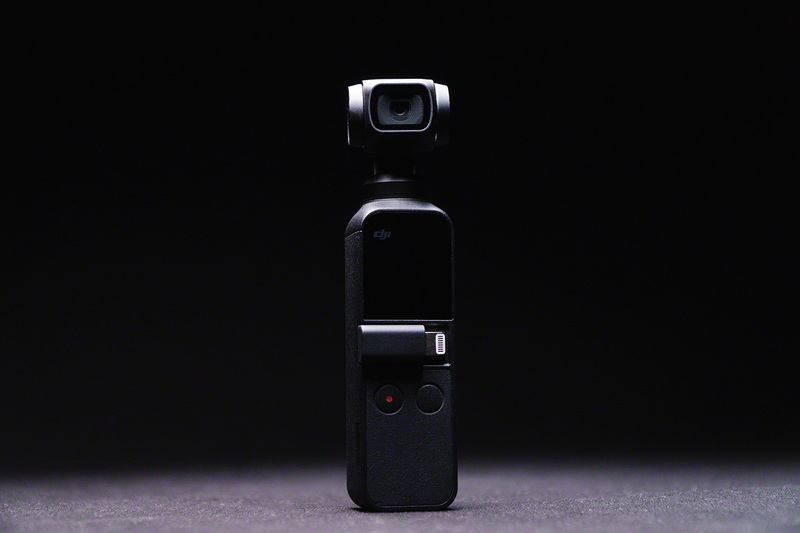 Using data from the gyro sensors, the Hero 7 Black is able to detect how the camera is rotating and use that data for stabilizing the footage in real time. To stabilize the footage, the image is cropped by 10%, but with such a wide lens, the footage still looks very wide. There are two drawbacks to doing stabilization this way. The biggest problem is that the lens is only so wide, so large or fast movements won’t be stabilized until the camera stops rotating so fast. Another drawback is that the stabilization doesn’t work well in low light conditions. Motion blur from the movement of the camera is still very visible when the shutter speed is low. With the Osmo Pocket, you don’t get any of the drawbacks of digital stabilization. You can make big movements and your footage will almost always look buttery smooth. The 3-axis gimbal on the Osmo Pocket works by measuring gyro data just like the GoPro, but instead of using the data for digital stabilization, it’s used to drive the three motors on the gimbal. Here’s another video I did showing what the stabilization on looks like on the Osmo Pocket and Hero 7. On the gopro, the stabilization is either on or off. On the Osmo, there are a few different modes to choose from. The first mode shown in the video is Follow. This is the mode I keep the osmo in for most shots. It locks the roll axis while stabilizing pan and tilt. While in this mode, you can switch between normal and sport if you want the gimbal to move faster. The next mode is called Tilt Locked and it’s just like Follow but it lock the gimbal tilt so it won’t look up and down. The other mode shown in the video is FPV mode. This mode is unlocks the roll axis which makes your footage look more like it came from a traditional camera. All of the movements are still stabilized, but the gimbal will react much faster than in follow mode. I haven’t done an official test yet, but the battery life on the Osmo Pocket seems to be a bit better than the Hero 7. After shooting some test shots where both cameras were recording at the same time in 4K with all of the same settings, I have 20% battery left on the GoPro and 36% on the Osmo. One thing that's nice about the Osmo is that the USB C port is on the bottom, so when using a USB battery bank, it's very easy to keep using the Osmo Pocket even while charging. On the Hero 7, there's a door that you open on the side to charge the battery, or you can simply replace the battery with a new one and keep shooting. The Osmo Pocket has one big feature that you don’t get with the Hero 7. It’s called Active Track. Just like on DJI’s drones, you can draw a box over something on your phone and the Osmo Pocket will start tracking it. It also as a face tracking feature that works in a similar way. What’s really cool about this feature is you don’t even need your smartphone to use it. Just tap on the screen where you want it to track and it will start tracking, or turn the camera around and it will automatically start tracking your face. Both of these cameras have some unique features that set them apart from each other, and at the end of the day, if I could I would buy both of these cameras. The Hero 7 Black gives you that super wide field-of-view, decent video quality and a super durable body. The Osmo gives you better stabilization, a more cinematic field-of-view, manual controls, super sharp video quality, a slightly lower price. Honestly, even though DJI would like you to believe that this is a GoPro killer, I think these two cameras are each in their own unique category. The GoPro Hero 7 Black Edition will be great for getting intense action shots just like you see in those GoPro advertising videos. For everyday videos, vlogs, travel, cinematic short films, that’s where I think the Osmo Pocket will be better. If I had to choose one as my only camera, I think I would go with the Osmo Pocket, then get the GoPro later on.